I am coming down the wire on a new production called LITTLE TOWN of BETHLEHEM. The crush of getting this show finalized has cut into my blogging time. 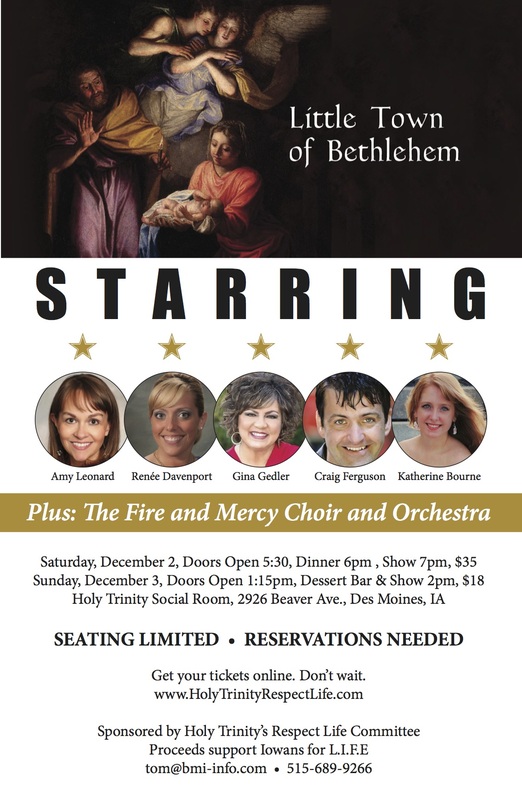 If you live in Iowa, I hope you can attend, as the show is promoted by the Respect Life committee for Holy Trinity Catholic Church. Proceeds will support Iowans for Life in their ongoing educational outreach promoting respect for human life. The Saturday show is sold out, but seats are still available for Sunday’s matinee. The All-Christmas music show features five outstanding soloists as you can see on our promotional poster above. They are supported by a 24 voice choir and a 17 piece orchestra. Can’t make it? You can still support the cause with your donation. Every dollar helps, so if you’re a Quiner’s Diner reader in Connecticut, North Carolina, or Singapore, you can still help fight the scourge of human abortion by clicking here and making a donation. Thank-you!